Living blocks away from 4th Street biased me from Day One. I became even more attached to this priority project when I helped mark our second round of sharrows from Wilton Place to Cochran Avenue. 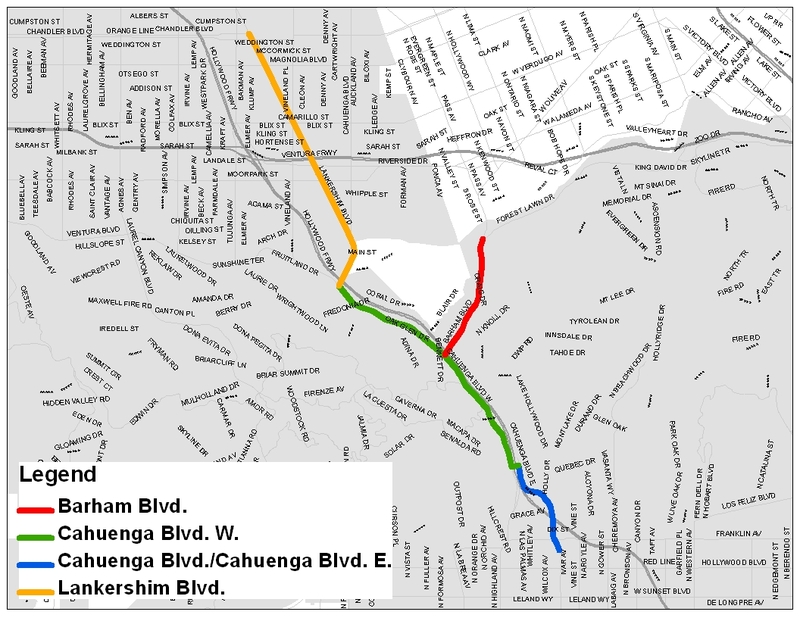 Personal prejudices aside, this future bicycle boulevard (called a “Bicycle Friendly Street” in the LA Bike Plan) has remained at the forefront of bike plan implementation discussions for good reason – as one of the most direct, low volume connections across the City. 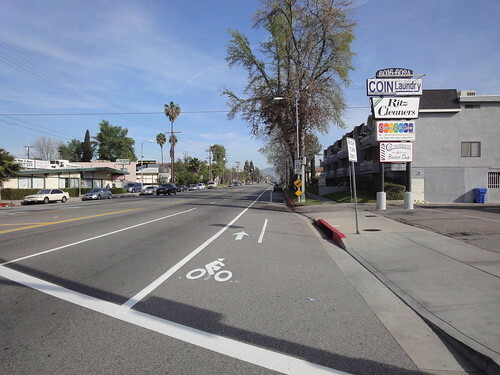 A Bicycle Friendly Street on 4th Street is one of the priority projects for the Bike Plan Implementation Team (BPIT) and has long been a dream of both the LACBC and CD 4 Council Member Tom LaBonge. 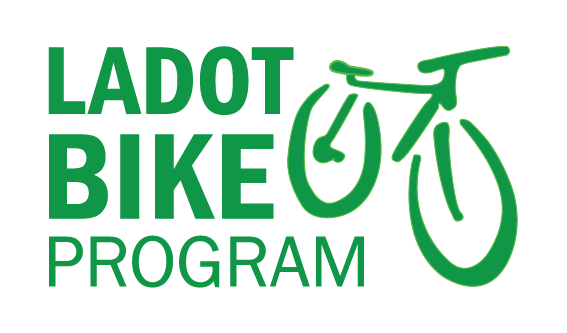 To roll out the next phase of bicycle improvements for 4th Street, we here at the LADOT Bike Program have begun community outreach efforts to determine the most efficient use of available bicycle infrastructure funds. 4th Street already has sharrows for over 3 miles from Cochran Ave to Hoover St. It also has new bike-sensitive loop detectors which can pick up the wheel of a bicycle at each stoplight. If you’re unsure of where to place your bike to activate the signal, check out our previous post here. True to our word, LADOT Bike Blog showed up bright and early this Tuesday morning at Union Station with our rain gear on. 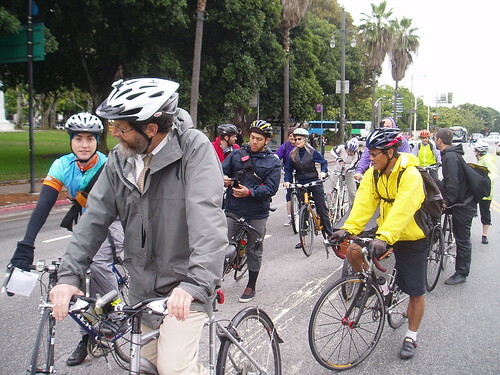 Once there, we met up with over 50 other bicyclists who had come out for the Downtown LA Ride. Rain had slowed to just the barest of misting by the time the ride took off, and a great time was had by all. 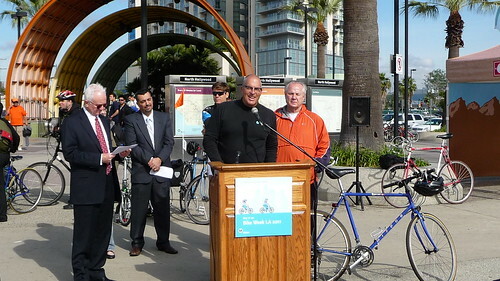 Bike Week LA started off on the right foot this morning at the North Hollywood Metro Station. 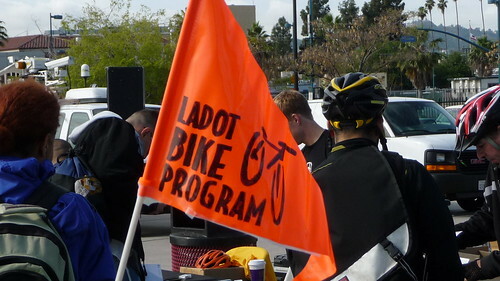 Representatives from Metro, LADOT and LACBC were on hand along with camera crews and bicyclists excited for Bike Week LA to begin. 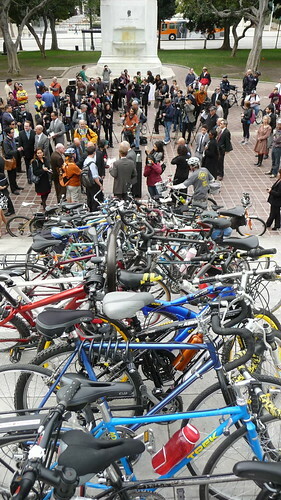 The kickoff was commenced with short speeches by LADOT Interim GM Amir Sedadi, Metro Deputy CEO Paul Taylor, LACBC Executive Director Jennifer Klausner, CicLAvia’s Joe Linton, Good Samaritan Hospital CEO Andy Leeka, and the bicycle-loving CD 4 Council Member Tom LaBonge. Topics ranged from Metro’s repeal of peak-hour bike bans to free bus rides for bicyclists on Bike to Work Day to new bike lanes on MLK and Expo to Mayor Villaraigosa accepting the Golden Spoke Award on Tuesday to bicyclists and drivers alike staying safe on the road to even the simple joys of exploring Los Angeles by bicycle. 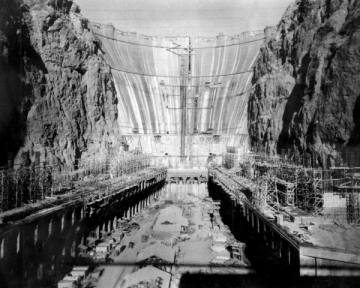 On March 1st 1936, the Hoover Dam was completed on the Colorado River, becoming one of the largest public works ever built. 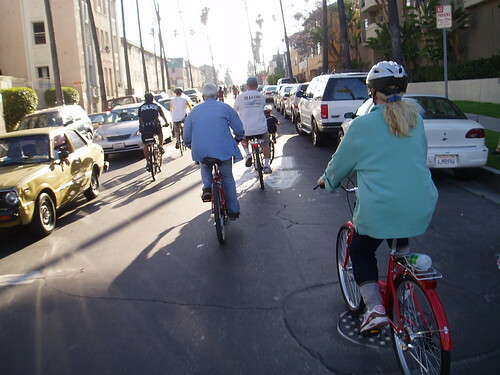 On March 1st 2011, the LA City Council will be asked to adopt the draft LA Bike Plan into the Transportation Element of the City’s General Plan. No less momentous an occasion! … kinda. The City Council convenes at 9:30 in the morning and a number of other bike-related meetings are scheduled afterward throughout the day. If you so desire, you could keep yourself busy all day Tuesday with various bike meetings. We’ve already got our scheduled fully blocked out.